If you grew up in the ’90s and loved nothing more than a long trip down the local drugstore’s beauty aisles, you’re probably familiar with banana clips. But also, if you’re SO not a teenager anymore, you’ve probably forgotten all about them. That is, until now: Kristen Bell just brought back the banana clip accessory, and in doing so, gave us a serious case of nostalgia…and also hair goals. Let’s just say we’re ready to head to Walgreens and snag up one of these plastic, old-school, totally affordable accessories. Bell made hers look gooddddd. The actress *always* keeps it real and that’s why we love her. In this case, she opted to wear the un-fancy hair clip for her recent appearance on Jimmy Kimmel Live and she ROCKED it. 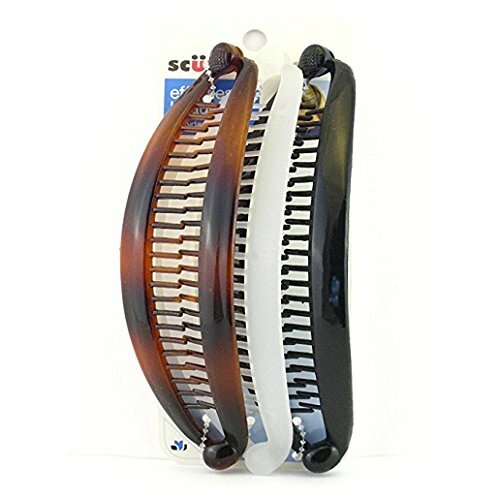 Quick refresher: Banana clips are those crazy, accordion-looking plastic things that cause your updo to fan out dramatically. Chances are, you’ll know ’em if you see ’em. It helps that Bell had some professional help in getting the drugstore buy to perform to its optimal abilities. Celebrity hair guru Christine Symonds shared a photo of Bell’s updo with a caption indicating it was, in fact, a banana clip holding up that glorious ponytail. “Yes, that’s a banana clip making @kristenanniebell’s ponytail game strong to very strong,” she wrote alongside the photo. Too easy, right? This is giving us ’90s flashbacks for sure!